Hi all, thank you so much for this wonderful recipe – one of the best breads I’ve ever baked (and thank you for replying to my comment in the Boule video thread :-)! After doing this recipe twice now, I wanted to ask if there is another one you have in your arsenal that’s a bit less time intensive, or if not time, labor? Say, some kind of loaf where I can start the poolish in the AM, get home from work and make the dough, do a stretch or two, proof overnight and bake in the AM, or even the following PM? That is to say, I don’t mind thinking ahead a day or two, but sometimes due to my schedule I can’t sit around stretching every 30 minutes. Thank you again! It may need a few rounds to get it right, but the bread is also a style you would really enjoy. Hope it works out and you will have the best loaves to fit your lifestyle! I love Tartine bread and have trying to bake it in a cast iron dutch oven most of the time rather than freestyle on a baking stone. I’m not sure I see any difference. Do you see any difference in the result between the two methods? Sometimes I get hardly any oven spring. What do you feel is the primary reason people don’t achieve oven springs when they’ve had it before? Hi, I would like to make this bread but have a question regarding the flour. 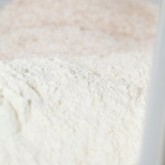 You mentioned that you tailored the recipe to suit European flours, which absorb less water. Do you recommend adding a bit more water if I’m using American flour? Yes that is correct. 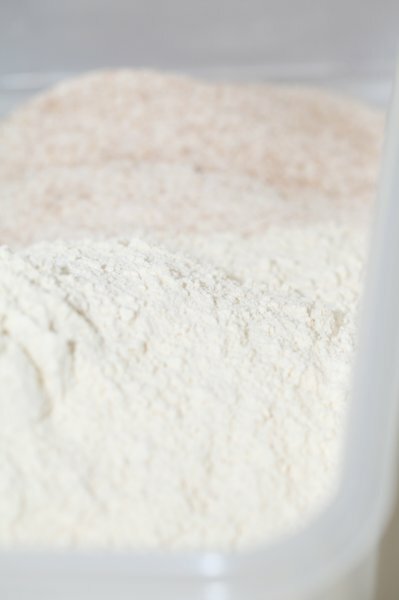 When using American flour we would suggest to start with the addition of around 2 to 3 % water to the final dough and see how that goes. 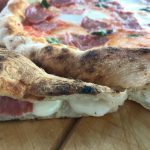 Is it possible to use 100% red fife flour to make this recipe? What adjustments would I need to make? I grind the flour at home. Until you wrote your comment we had never heard of fife flour. Hope somebody can help you with this based on experience. 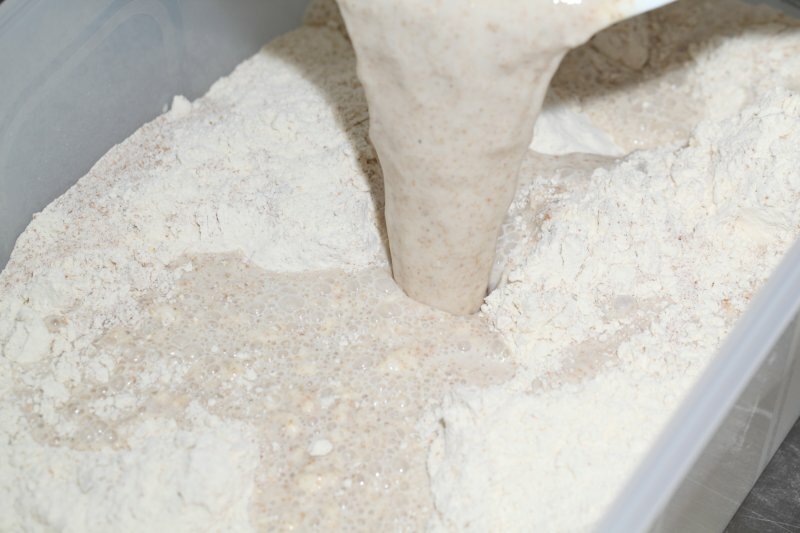 If it’s whole wheat / home ground flour you are using, it is to be expected the dough could do with a slight increase in hydration. Thank you Linda, hope we can try this flour one day, that would be great. Enjoy the baking, eating an sharing! Just want to say that I love the calculator! Thank you! I’ll be trying this very very soon! 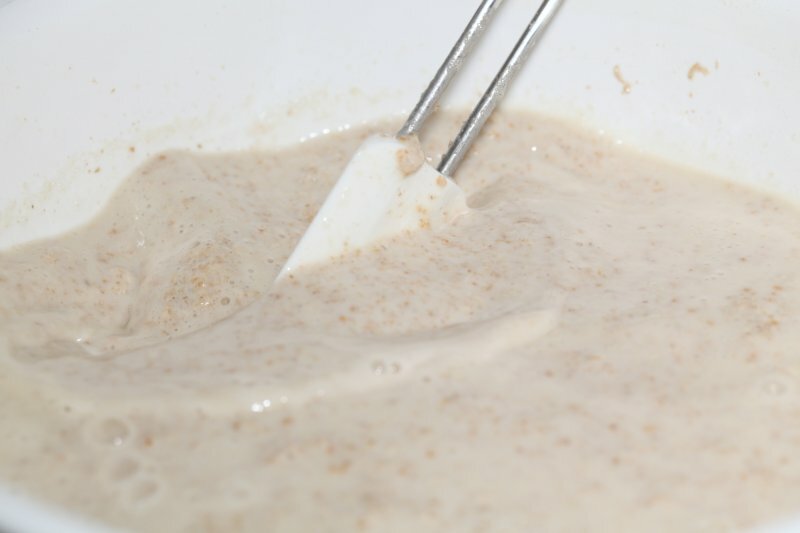 Your website was one that I frequented often when I first started my sourdough starter journey. 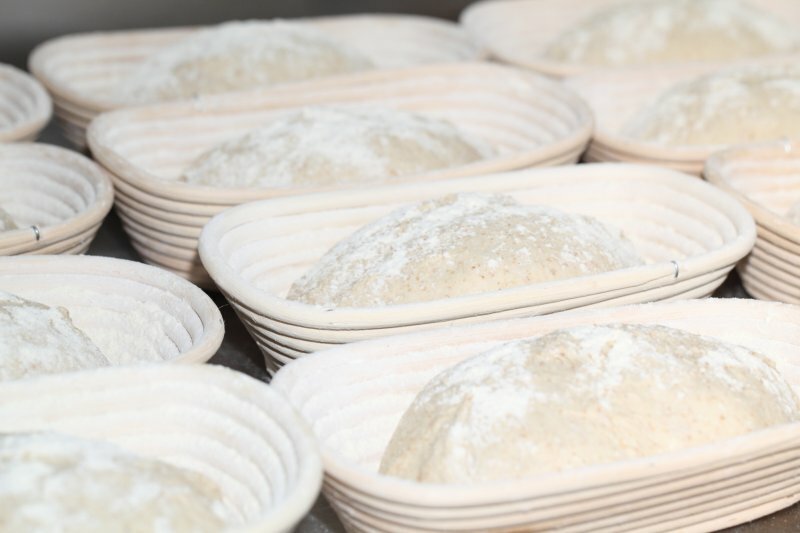 For the hybrid version with instant yeast in the final dough we give instructions at the bottom of the recipe under ‘Making the Quicker Hybrid Version’. Indeed the yeast goes in with the water part one, but we only mention it in these instructions at the bottom to avoid confusion with the original version. We refer to these instructions via the optional yeast mentioned in the ingredients list. I have a question. After the sixth fold and strech if I put the dough in refregirator to be baked early in the morning is it possible. 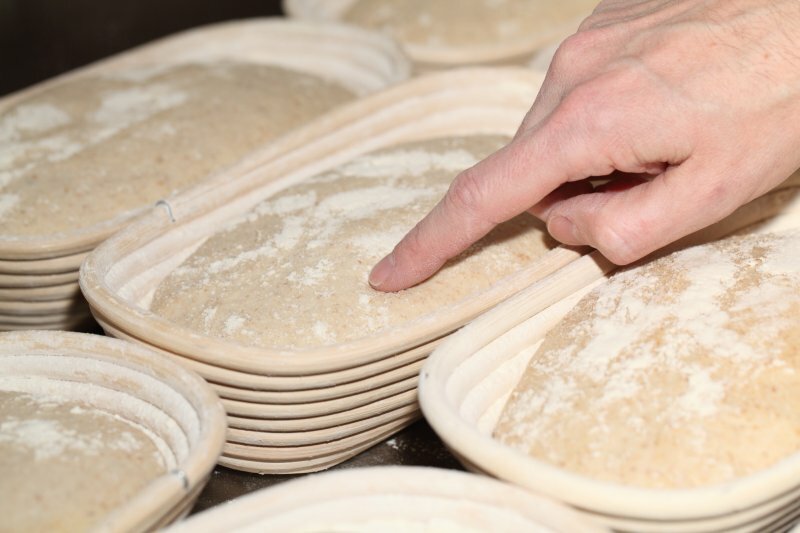 Yes, that would be possible, but how long the dough can stay in the fridge without over-proofing we cannot say, so try and start if possible with a shorter period. Better if it still needs some extra time to proof out of the fridge than the over-proofed dough of course. Also this extra retarding of the dough makes that the end result will be different, probably more sour and with a (slightly) different crust and crumb. 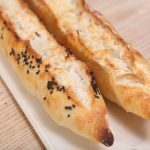 Am I able to make this bread using my own sourdough starter for the polish? If so, how much should I use? 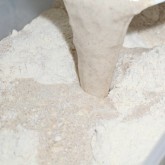 When making my bread, I usually use about 200 g of starter. We work with a two step system. 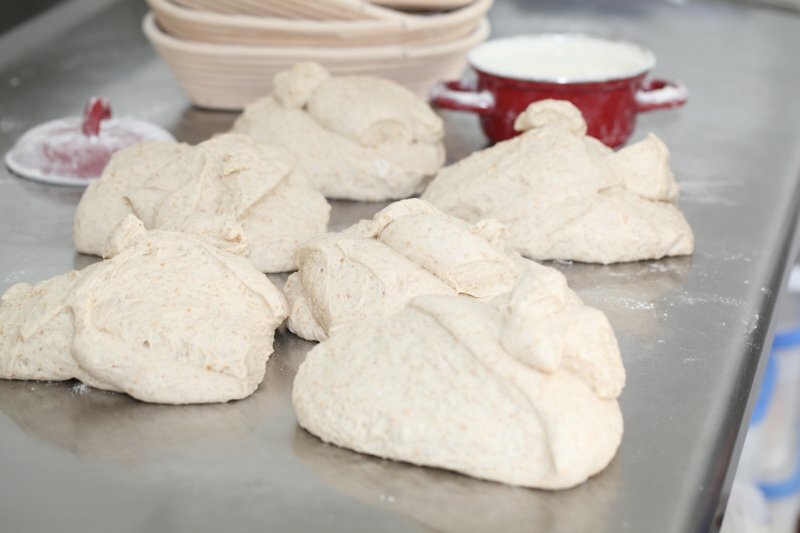 When using a preferment (like a poolish or a biga) we use about 15-20 grams of sourdough for a sourdough loaf. With this small amount of sourdough you create a fully active sourdough preferment overnight which you then use to build the final dough. 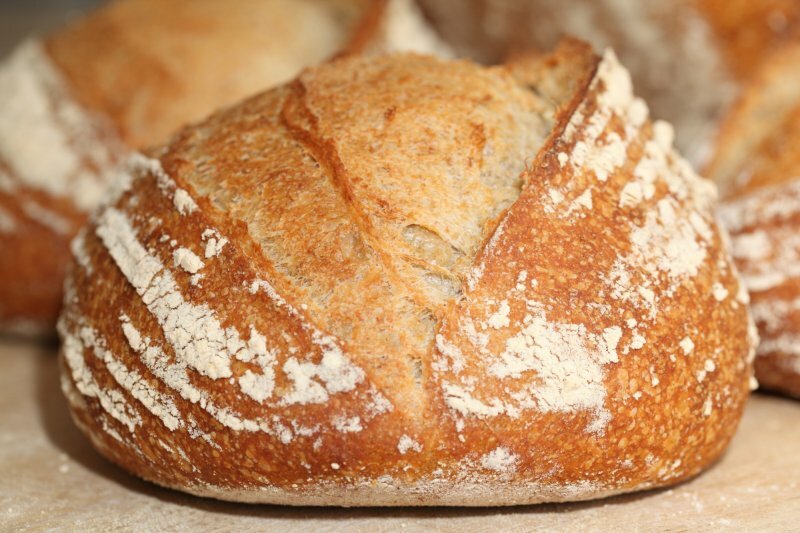 This way you can keep a small starter and still have the full sourdough flavor. 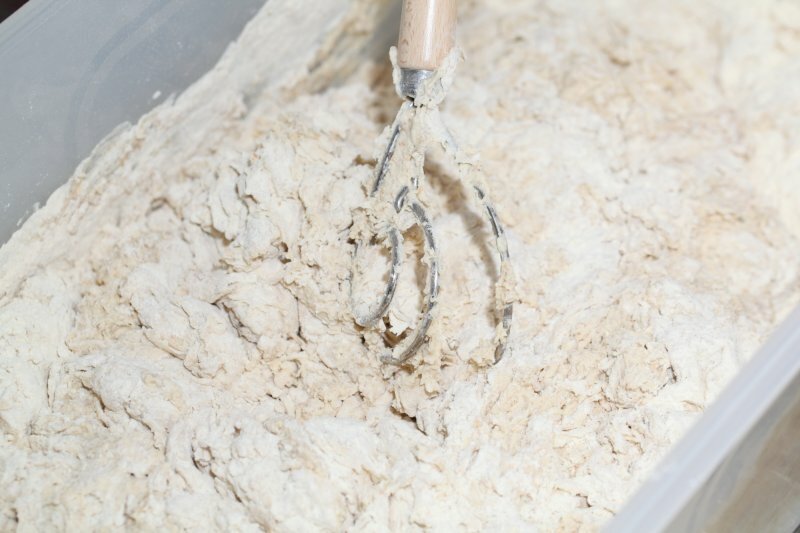 Big advantage for home and hobby bakers is you are wasting far less precious flour when refreshing your culture than you would maintaining a big one! So, you could just take 10 g of your own starter culture and stick to the recipe as described. 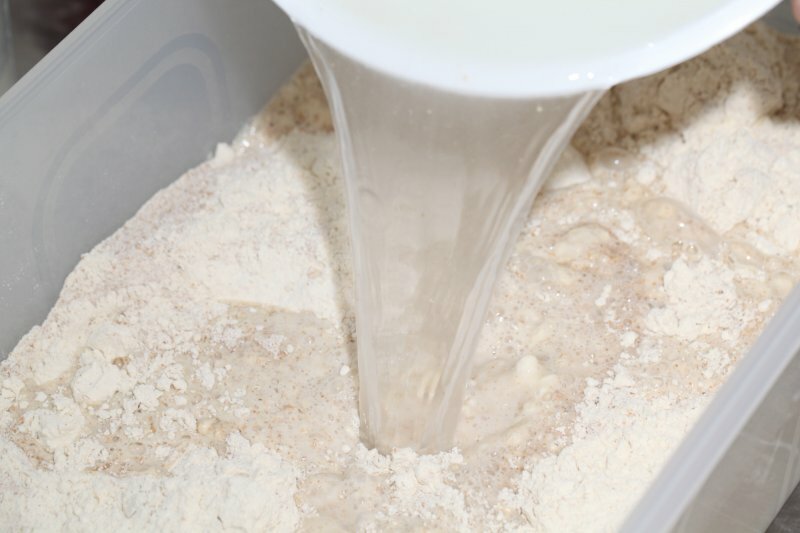 Or you could use around 100 grams of your (active) starter to the final dough, but make sure the ratio of water / flour is the same as in our recipe for the amounts to be correct for this recipe. Thanks for your comment. That’s true, Tartine is not know for the effortless method. 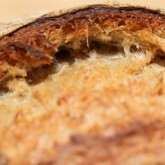 We really like the results we get but you probably will get back to your great working sourdough recipe. I’ve never used SD starter before, but would like to try this recipe. Two questions: 1) is SD culture the same as starter and, 2) will this work with a SD starter made from all-purpose wheat flour rather than your rye flower? If I use the latter, do I need to change anything in the recipe? This is our method and there are many methods and names and it can be confusing. 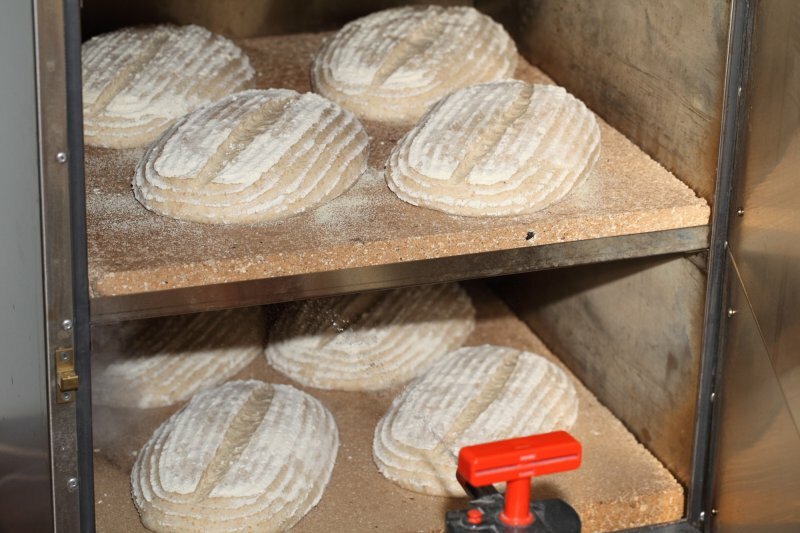 You can use wheat flour for your starter culture, but we would advice to use (organic) whole wheat flour to develop a good culture. 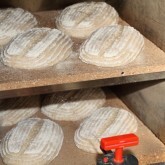 For the B40: We preheat at 240C for 1.5 to 2 hours, then load the oven. Then after about 14 to 17 minutes we temper the oven (turn it back to 50 so the fans are still running, but the browning will almost stop). This is ‘baking on a falling temperature’ to simulate the workings of a wood fired oven. If you want to bake continuously, you keep the temp stable at 200 to 210 (only possible with the B40). The method above works for us, but we have to say we have never tried your suggestion. The important thing is also to find out about the exact workings of your thermostat, because it is a mechanical version, it can be off by -10 to +10, although Rofco uses a high quality one. 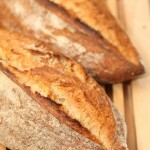 I have only recently started my sour dough journey and found this recipe delicious! The video on stretching and folding was very helpful and I now know exactly how you are supposed to do it, thank you. 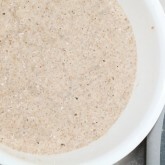 Do you have any tips on using 100% spelt starter and whole spelt flour? And when would be the best time to add seeds to the dough? Thanks for liking the recipe and video. 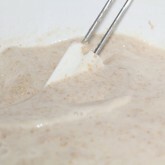 Your spelt starter can be used instead of our rye starter without any adjustment in our recipe. 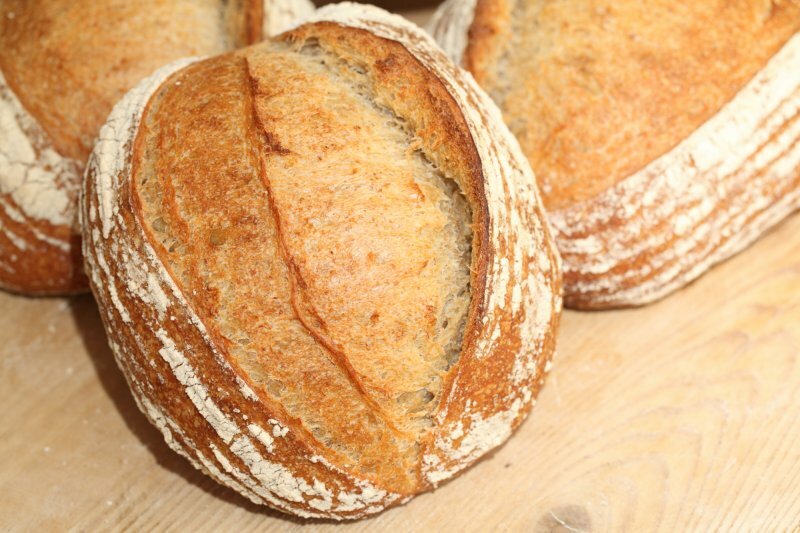 The use of whole spelt is a different matter, because it would mean first of all handling the dough very carefully (the gluten in spelt are different, there’s less and they are more ‘delicate’). Next to this spelt absorbs moisture in a different way. 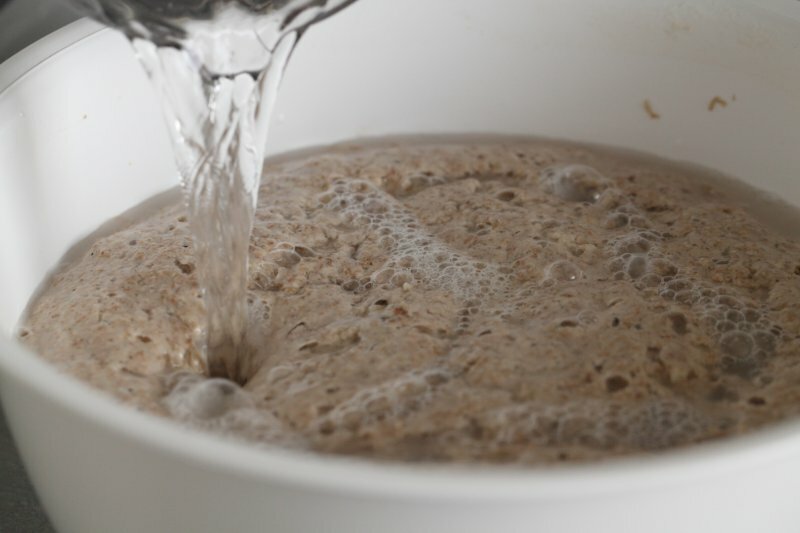 Spelt is more water-soluble than wheat, so you normally need less liquid than with whole wheat. We would suggest starting with a percentage (20% for example) and see how this turns out, and slowly increase the amount. 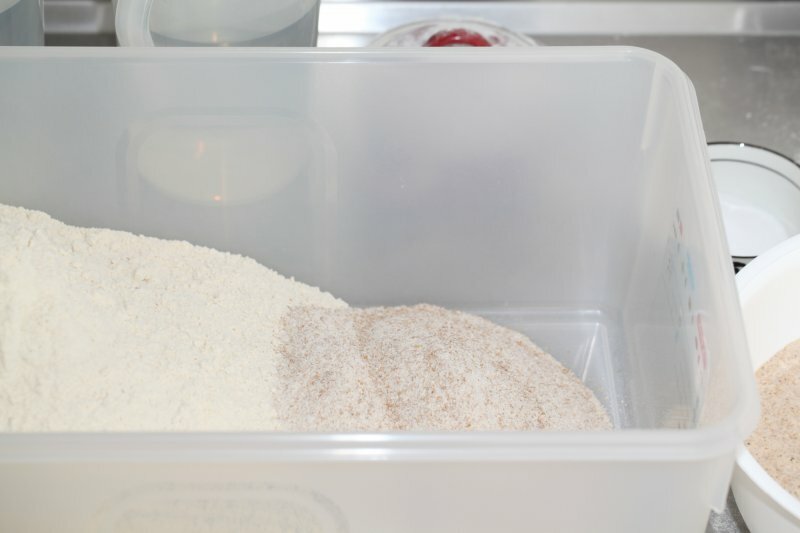 You can add seeds to dough at different times, but most recipes will tell you to add it when you make the initial dough. Thank you so much for your website, which is now my go-to place for bread recipe ideas. I find your recipes are precise and instructive without getting too bogged down. 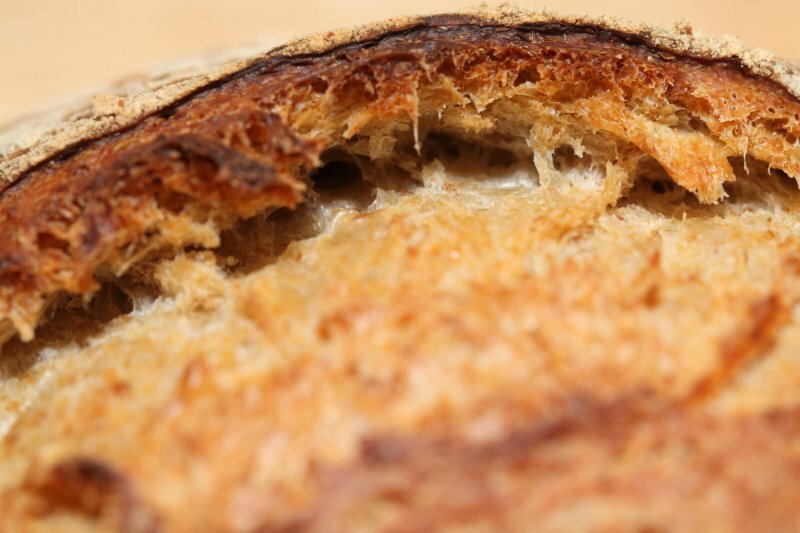 I followed this one pretty much as written and ended up with a fantastic bread with a moist crumb, great hole structure, sweet and just slightly sour. The main difference is I sifted the whole wheat flour. My wife says it’s my best yet. Even my five year old daughter, who is not a fan of sourdough, likes it. 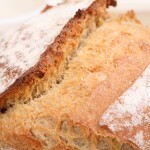 I came to your site having found your whole wheat bread recipe but this one is now my favorite. 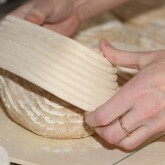 It really showed me what the stretch and fold method can do to develop the gluten of the bread. I hope you keep up your great work on the site. Thank you so much Hank, for your enthusiastic feedback. 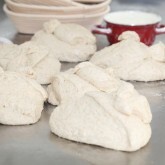 We do love this bread and the method too, although you cannot go anywhere for quite a while, it is so worth it. Love your website and the great instructions and advice. Never made sourdough bread before and my bread making has always been to use the bread machine to mix and rise then oven bake. So I made your sd starter as instructed, although I didn’t get as much rise as shown in your video, it did have air bubbles in it so I kept going. After about 6 days I made the poolish from it. It didn’t look like much had happened the next morning, although I could see some little bubbles, but I went ahead and made your tartine loaf. The final rise took a bit longer than the 2.5 hours in the recipe (about 3 hours), and I had added a little less than 1/2 tsp of yeast dissolved in the 20g of water and the salt. I also added about 1/3 tsp. of diastatic malt. The loaf turned out great, except I think my oven needs a lower setting than the recipe calls for because it was starting to burn on the outside after 40 mins. The inside, however, was brilliant, light and fluffy with lots of little air holes. It tasted good too, but not quite as sour as I would like. How can I get a more sour flavour? By the way, I used organic white all purpose flour. Can’t seem to find organic bread flour here in Vancouver. Thank you for your comment and great to read about your already excellent results. Just turn the oven temp down (try around 180C after probably around 20 minutes) as soon as your crust has the right color and bake for the remaining time. So still start at the high temperature to get a good oven rise. It’s me again…I finally had the chance to try this bread. It is fantastic!!! 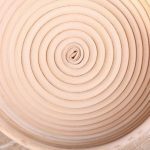 I found the whole process of making the dough and the folding and then rolling very therapeutic. I really enjoyed making it AND I loved eating it hahaha…. The smell in the house as the bread was making was torture, hahaha, but when it was ready I couldn’t help myself and didn’t wait long for it to cool off, I had some warm with butter. What an amazing loaf. I will be making it again next weekend. Thanks again for an incredible recipe. Can’t wait to try more of them. Thanks for a delicious and simple recipe! I’ve made this bread twice now, each time with slightly different (high quality) flours, and both times it’s been amazing. A question, is it possible to modify this recipe to use Spelt instead of one/both of the other flours? If so, what else would need to change with the recipe? 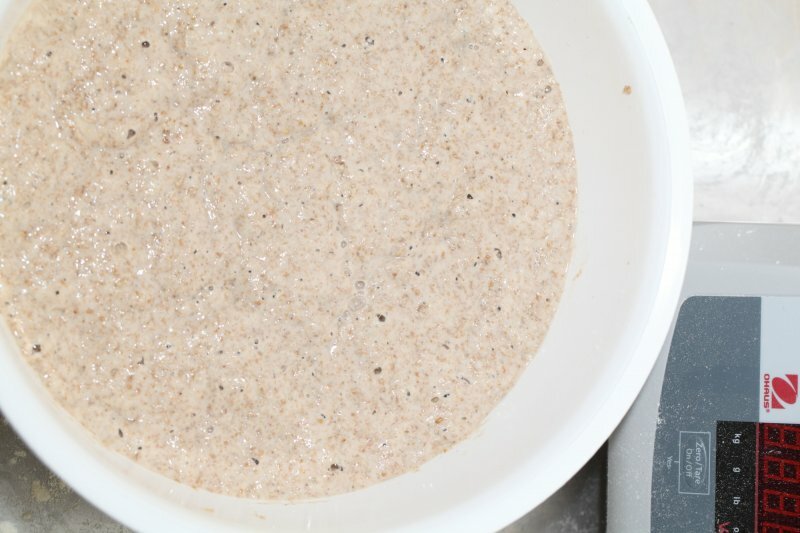 Even if the answer is yes, I realize that the recipe modifications are not something you can answer without experimenting yourselves, but are there any general rules regarding replacing wheat flours with spelt flours? It would be possible to make a spelt version, but we cannot advice you from our own experience with this recipe. We would experiment by starting with a percentage of spelt and not 100% spelt right away. 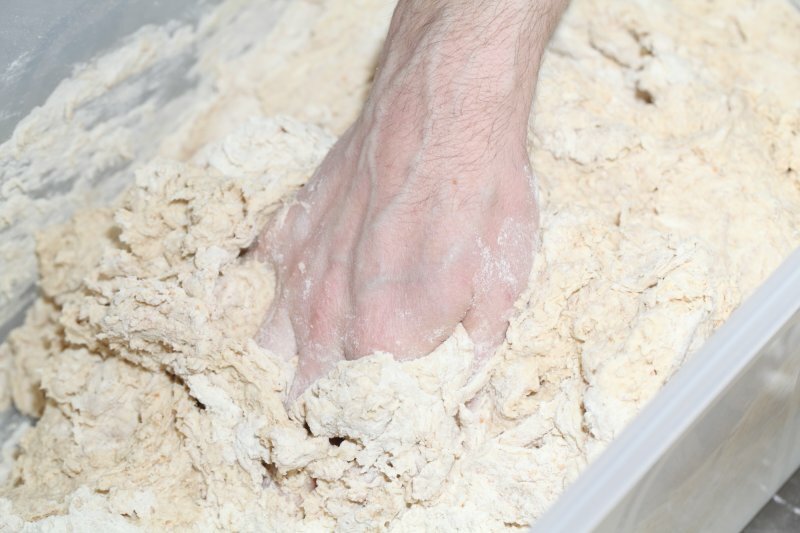 In general the gluten are different and more delicate and you need to carefully build them up, so be gentle with the dough. The hard part is to give the bread enough structure. 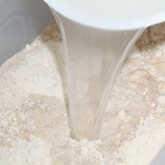 Next to that the amount of water needed will be different, also depending on using whole wheat or white spelt flour or a mix. 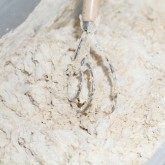 It is often advised to use less water to handle the dough better and to keep the proofing loaf from spreading too much. Best to just work your way to it and experience in steps what is needed. Hope this helps a bit and best of luck with the spelt baking! Thanks for posting this Alex – I had the exact same question re: spelt, very useful links! Great to see Alex, very interesting. Thank you for pointing it out to us. Thank you so much for sharing this recipe ( hybrid version). It always turn out super amazing! Thank you for your very kind comment. This method is still one of our favorites and the taste that develops during the process is one of the absolute best! Hi, great recipe! Thanks. I’m trying to do this with 100% wholemeal spelt flour and my loves are coming out a little flat. Do you have any suggestions as to how I might adjust the recipe accordingly? It is very normal for a 100% wholemeal (spelt) loaf to be more compact and flat. First of all the gluten in spelt are less and also different from those in wheat and the wholemeal makes your loaf heavier. Other than adjusting the water (How much more we cannot really say) and extra sets of S&F it is a case of accepting that this loaf will be different. Morning weekend bakery! Thanks for your great recipes. I have a question about the starter. You say you feed it once a week after your weekend baking. Does that mean you use a hungry starter straight out of the fridge for the poolish? Or do you take it out, feed it and then use it? When it is at its most active point? Hi 🙂 i have tried recipe and Bread was DELICIOUS :D. Just one question – how about night 10 – 12 h. Proofing in the fridge? Proofing in the fridge is no problem, but you have to adapt proofing times accordingly of course. Did this recipe exactly to the instructions, and got fantastic results. Thank you! Just one thing – I followed your advice to put the temperature slightly higher if creating steam in the oven, but the colour on the outside was darker than I would have liked (all that evil acrylamide…). So I think next time I will just stick to 230 C.
Thank you for this recipe and this great website! It’s a true joy for the enthousiastic home-baker. I have a question about dough temperature: I aimed for the advised 25 deg C but ended up slightly warm at 27,5. But by the first S&F, I noticed that the dough had already dropped to 21 C. Is that a problem / will development take longer than indicated that way? Maybe the problem is that I’m only making 1 loaf, so the quantities are small and so the dough will lose temp much quicker than if making a batch of e.g. 8? Yes you are right in your assumptions. 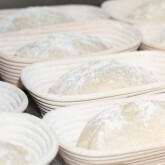 And for these reasons it is important to find a spot where your dough can stay the desired temperature during proofing. You can even use an oven for this that you slightly preheat and then turn off. Good luck with it and happy sourdough baking! Today I tried, I made the poolish at 22:00 hors and started to make the poolish tartin; first thing that was the time of 30 minutes of 6 break was, ok but it seemed a little bir to me. The result was wonderfull but, the only one point was not good salt it was not salty at all. We use the amount of salt that is recommended nowadays, and we are used to this amount and the flour we use also has lots of taste. But it is very easy to add a bit more. 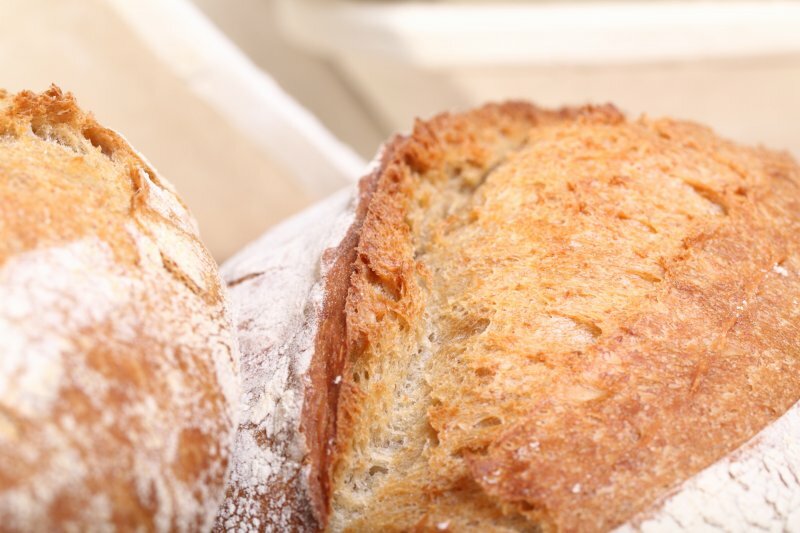 We would think, if you like it more salty or are used to more salt we would suggest using between 8 and 9 grams per loaf. but my question is not about the recipe this time but about the proofing basket. could you, please tell if the volume of the basket is important. I mean should the sides of the basket kind of support the dough? or this is not important? maybe you can recommend how to chose the size of the busket. thank you very much. If we take this recipe as an example: It has a total of 764 grams for ingredients. 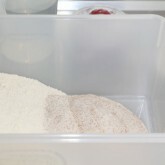 You choose the basket that comes closest to this amount, so a basket for around 750 grams. 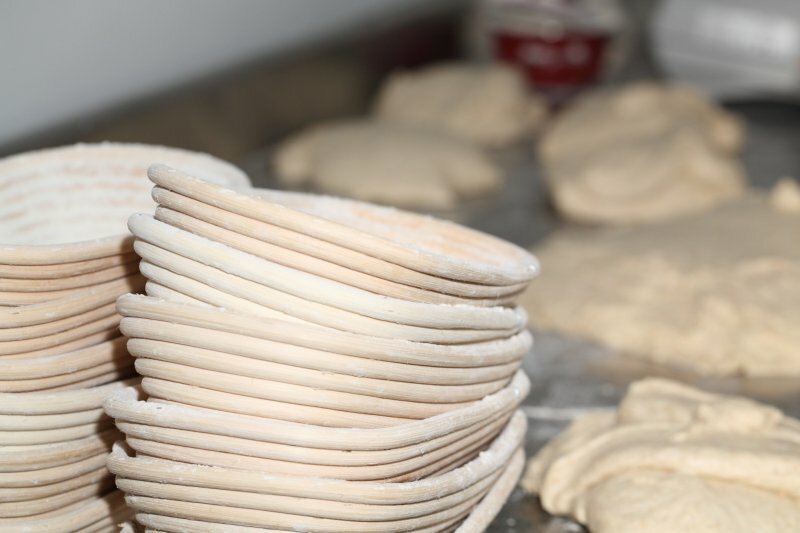 Yes the basket is there to support the dough, but if your dough is strong enough (right amount protein) it is no problem if the top of the dough comes above the level of the basket. The baskets you see in the pictures are also the 750 gram ones. 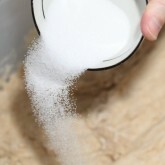 As for the salt level, that is very personal and easily adapted. 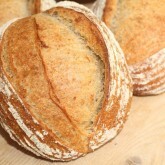 We think the amount of taste developed in this bread, using good quality flour, is so great, too much salt would spoil it. We would advice never to go over 1.8 to 2 %, but please feel free to follow your own taste in this. Robertson showed in one of the videos or do you think that’s not as effective ? Thanks a lot – great website for bread people, such a lot of valuable infos. Do not know if you have tried the CR method in the meantime, but it should work very well. Would be interesting to compare results of the two maybe..
get back with a feedback. I did the workaround for calculator, it worked a treat. Thanks for trying it Bob, glad to hear. But still need to fix it of course! Spelt bread worked nicely and it is really tasty. I will be using this recipe again. Could you please advise on changing the recipe slightly by using more whole grain flour? 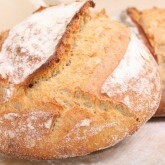 Instead of 350g bread flour and 40g whole grain- 310g bread and 80 g of whole grain. How much more water should I use? 10-15g more? 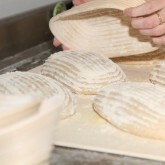 It is no problem using spelt, but the result will be a bit different compared to wheat, often more compact. The gluten structure in spelt is more ‘fragile’ and can break down. 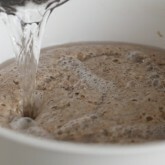 Could be that you need to slightly alter the hydration too and use less liquid to begin with and judge the result. 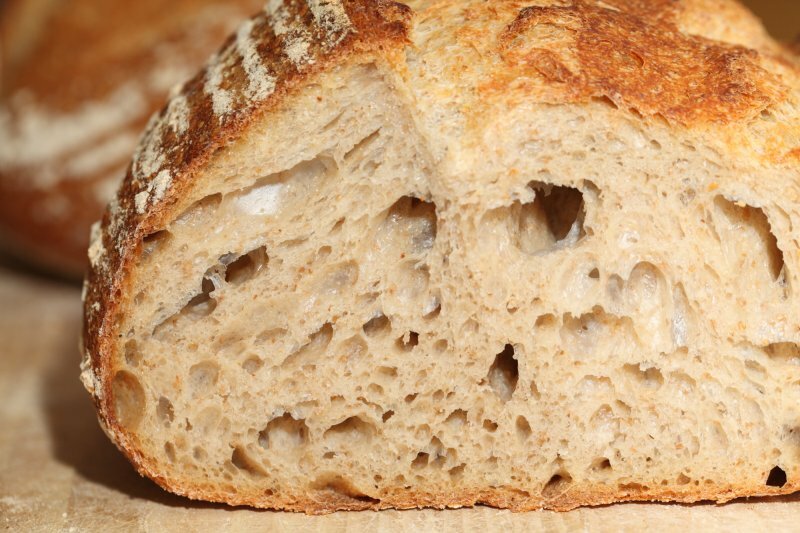 To answer your question, if you use bread flour with more whole grain you should indeed use a bit more more liquid, (15 g is a good start) but if you use spelt like you say, it is again a different story, like we describe above. 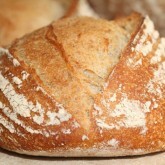 After reading your reply I smiled because taking into consideration your comments my bread worked fantastically :). It was nice and fluffy with open crumb (but no big openings like tartine bread), I managed to form a ball shaping it and it kept it’s shape while being baked. So next time tiny bit less water and I have my perfect recipe for free formed spelt bread! Yuppi! All my previous spelt breads were baked in a tin (too wet to shape) but the good old friend got very rusty after two years of sourdough bakes and I didn’t managed to find a replacement of the same dimensions yet. Thank you for the feedback, so good to hear. Wishing you many excellent loaves! Hi, I recently found your website after attending a baking course in the UK. I tried the tartine recipe and it was fantastic. The question I have is, if I want to make two loaves using your calculator, at which stage of the folding technique would I divide the dough into the two loaves. 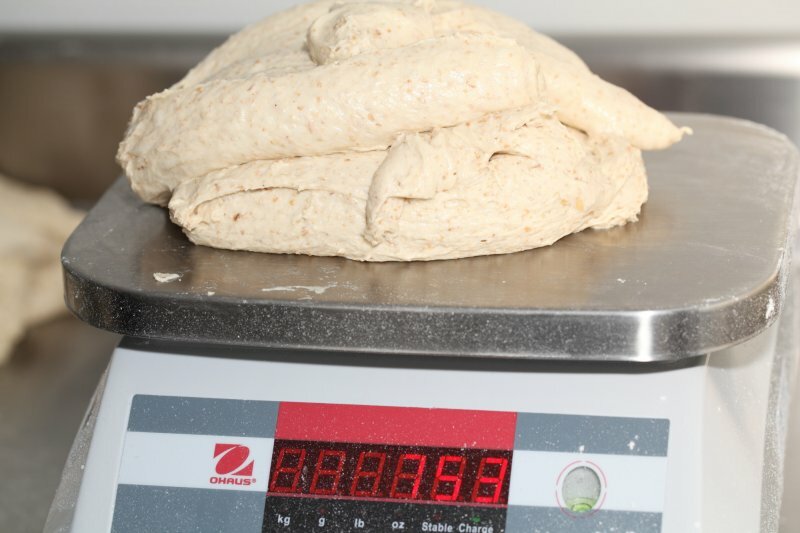 Also when I tried to use your calculator to make a larger loaf, I changed the amount of flour, but when I pressed the calculate button, the original weight of flour returned giving me the original recipe amounts. I want to make a 1kg loaf. 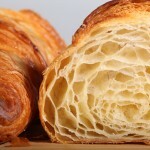 Great site, especially like the timetable at the end of the recipe. Makes it so much easier to calculate times for making bread. Thank you very much for letting us know. There seems to be a small bug in the calculator (we will correct this) when trying to change the amount of flour. The work around is to change the amount and not click on calculate but click in the white space next to the calculate box. Sorry for this! Time to divide the dough is the stage you also shape the dough (so at 12.50 in the time table). Happy sourdough baking and lots of loaves! here where I live the room temperature can be 30 C in summer and 11 C in winter. 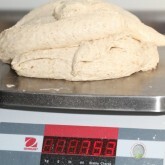 could you please, tell what room temperature you meant, then I can adjust the schedule of my dough. I made this bread exactly as the recipe stated and it came out absolutely perfect. I cannot believe how delicious this bread is, and even even though it takes some time, it is actually very easy. I’m looking forward to making this again! That sounds more than excellent, thank you for the feedback. 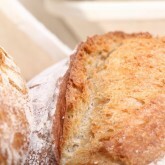 This bread stays our firm favorite too! I made two loaves of bread following this recipe exactly as it is stated, but my dough was kind of loose and I got rather flat loaves. Should I increase the amount of flour due to the altitude of the city I live 6,300 feet? Or what should I do? We think rather than the altitude the first thing you should look at is the flour you use. It should have the right amount of protein. 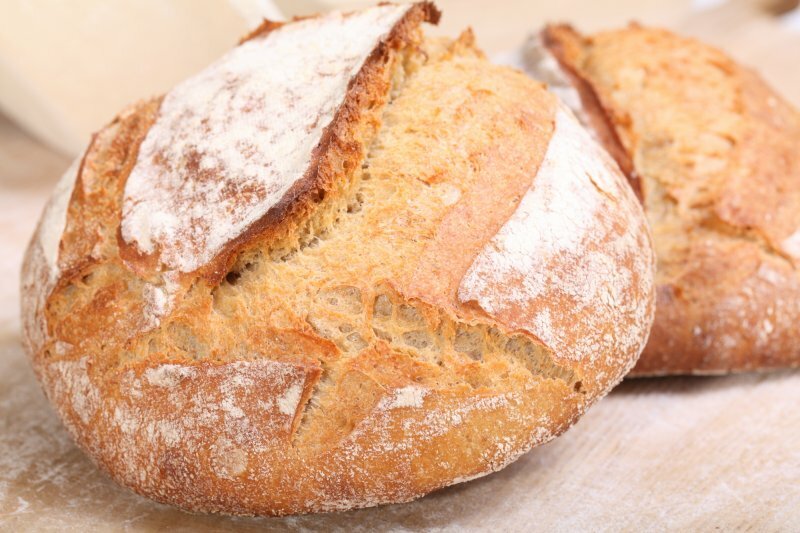 If possible buy a strong(er) bread flour with at least 12% protein so you can develop enough gluten strength to get your loaves to rise and ‘stay strong’ too. I will try your recipe and schedule method tonight but I had a question. 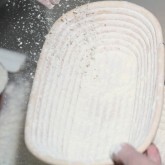 What you guys think about the French Technic of “slap & fold” the dough ? 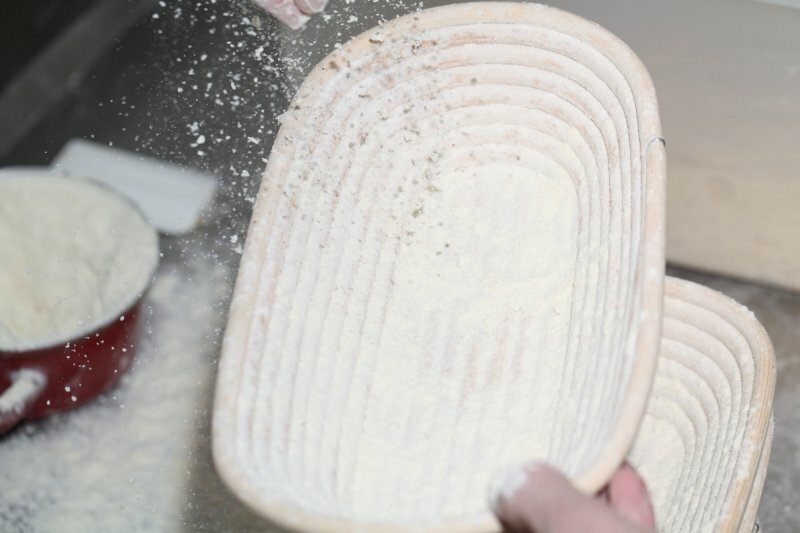 I saw the French Boulanger Richard Bertinet baking a sourdough bread using this technic and I did the same in the past on a french baguette and could noticed that doing this way the dough gets fast structured for the last bulk fermentation. 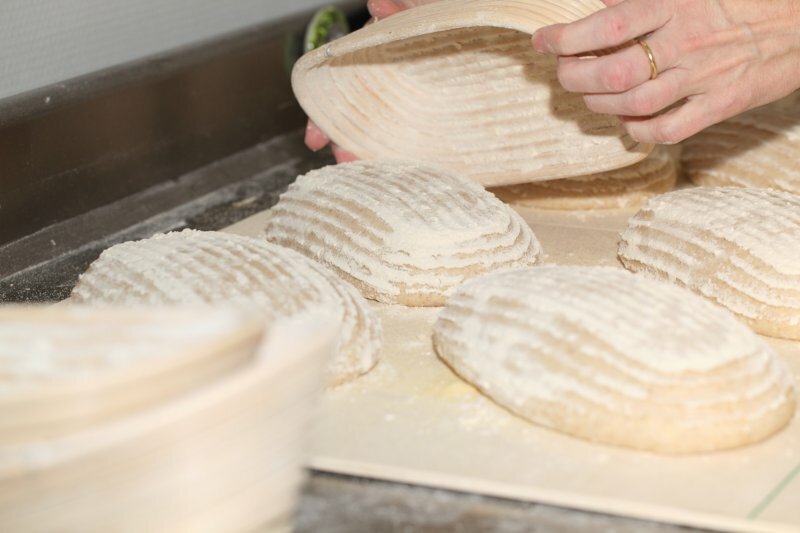 the result in a sourdough bread gets any difference ? We know this method and many people use it and like it. We have never really tried it, because we use other techniques which work well for us. We think you could very well use this technique for this recipe too, no problem. 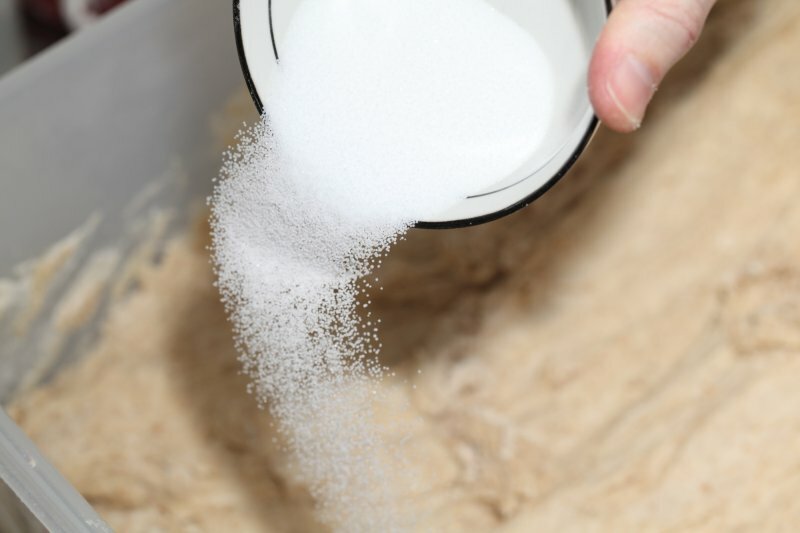 We know it can only be a bit of a challenge to use this technique with small quantities of dough (not so much to slap around) but this is also true for the S&F method. 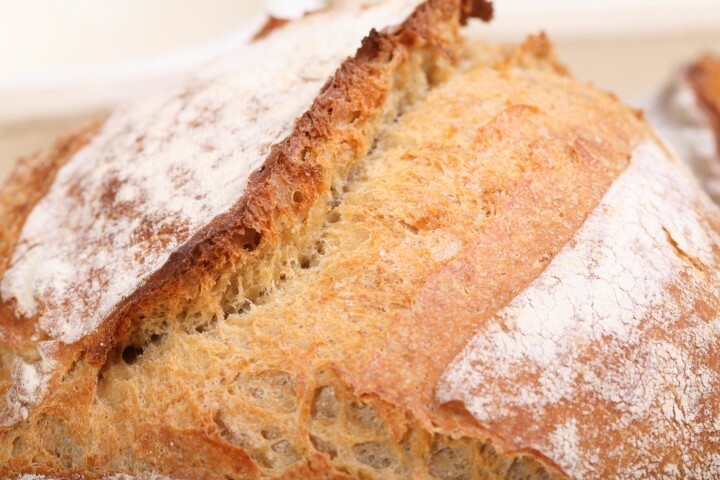 What sort of hydration would you use if you were using flour from De Zandhaas? I made a Tartine-style loaf earlier (first sourdough in the Netherlands!) and it tastes wonderful but is a bit of a pancake! That was at 65%. Is it too high for that flour? Another loaf with instant yeast looked better so I’m thinking it’s my lack of practice with sourdough maybe. Any tips on the flour would be gratefully received! 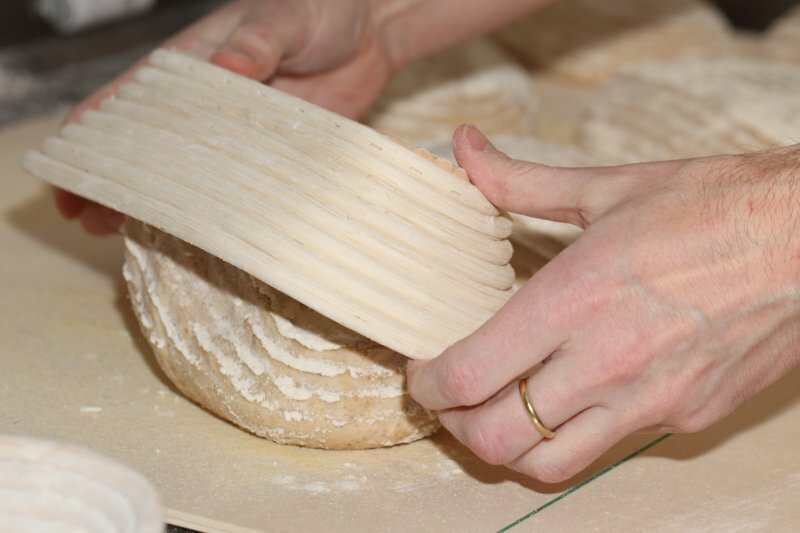 Can you tell us what flour you are using exactly? 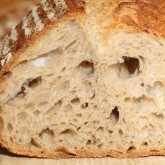 The recipe above was made with De Zandhaas organic flour (Eko tarwebloem) at 69% hydration. The non organic version could have less protein and need more development maybe (extra S&F sets). It is important to weigh the water so you know exactly how much you are putting in, so no measuring cups but scales also for the water.